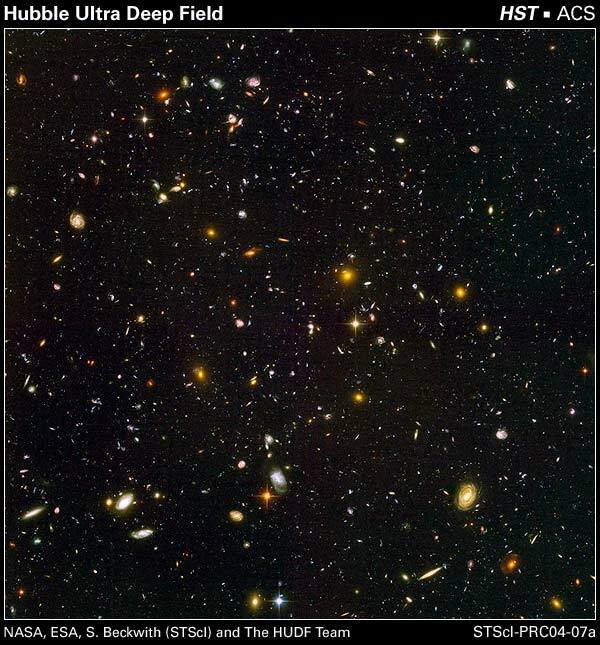 It’s a tiny patch of sky, and each point of light is another galaxy. There are 10,000 of them in this photo. You can read about the experiment that produced the photo here. Thanks for sharing this sublime art piece. So this means that if there isn’t a god, there is something right? What I mean to say is that our understanding about the true reality of reality is about as small as our place in the universe, right? At any rate, I’m going to break out some serious Medi and watch this video again ASAP! These are such remarkable photos. I remember as a kid in high school, the assigned debate topic one month was something like: Resolve, the US should significantly increase spending on space exploration. Many negative cases were constructed around the ‘flop’ also known as the Hubble Space Telescope, due in large part to a flaw in its original optics. There were serious debates about whether the Hubble should be fixed at all. Fifteen years later, and after four major servicing missions, the Hubble continues to deliver breathtaking iconic images of the cosmos. Less war, and more Hubble, please! I think I see Kolob! Did you ever notice that God spelled backwards is dog? Have you ever really looked at your hand? I mean, REALLY looked at it? Let’s have an extra WOW! for Cedric and G-Lock’s bundle of joy today!!!! 9: Hadn’t heard the news yet! Many congrats!